Steph celebrates as he makes a basket. 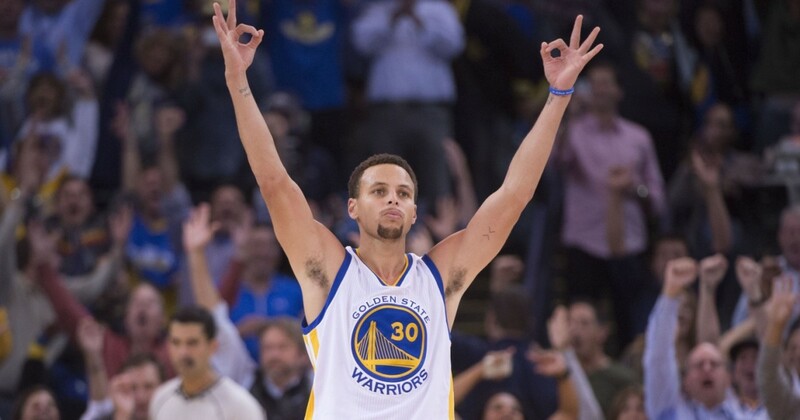 Steph Curry is one of the best shooters in the history of the game. 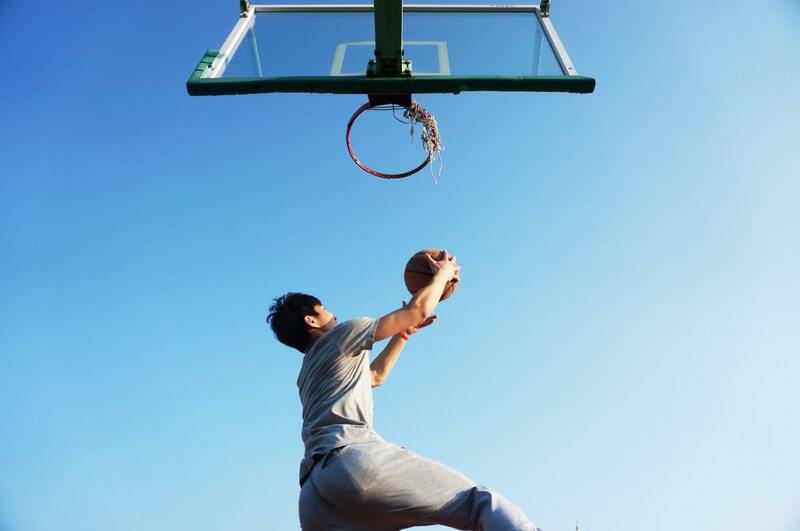 It does not matter whether it is from half-court, the three-point line, mid-range, or from the charity stripe. Steph Curry can do it all. The son of Dell Curry, a 16-year NBA veteran best known for his time with the Charlotte Hornets, Steph has apparently inherited his dad's shooting stroke. A young Steph could be seen together with his dad shooting the ball during warm-up. Nobody knew that this young boy would eventually surpass his dad. Steph was overlooked by many teams in the 2009 NBA Draft. He was after all a lean 6'3" guard from Davidson that looked more like a bench player than an MVP and All-Star. Minnesota has a chance to nab Steph twice as they had the fifth and sixth pick and chose Ricky Rubio and Johnny Flynn instead. Skip Bayless, a then anchor for ESPN, was an advocate for Steph and said that he was supposed to have been the first overall pick instead of Blake Griffin. Skip got ridiculed as his idea seemed preposterous at the time. A few years hence, Skip was proven right. In a league that puts a premium on three-point shooting, Steph reigns supreme. Steph holds the record for the most three-point field goals in a season with 402. He also holds the second place spot with 324, third place with 286, fifth place with 272, and tenth place with 261. He has led the league in this category 5 times. He did this with a 43.8% shooting clip. To test his mettle against his fellow marksmen, Steph joined the Three-Point Shootout five times and won the 2015 contest. Steph lost the following year to his teammate and fellow Splash Brother Klay Thompson. Steph has also been the regular season MVP twice and the only unanimous MVP in league history. Steph led the 2015-2016 Warriors to a 73-9 record and beat Michael Jordan's 1995-1996 Bulls record of 72-10. Steph is just in his prime and already has two championships and three Finals appearances. Only time will tell how far Steph will go and how many more records he will shatter. 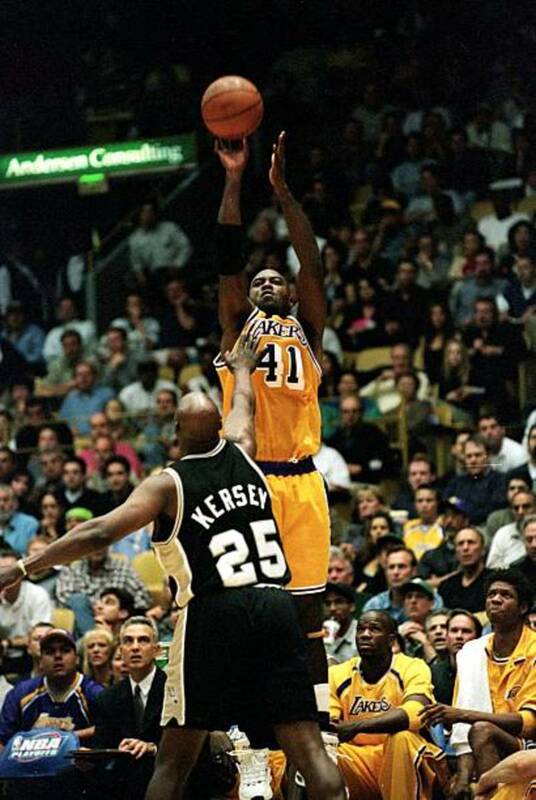 Glen Rice Shoots over Jerome Kersey. Glen Rice was one of the most prolific three-point marksmen of all time. He shot 1,559 three-pointers during his 15-year career with a 40% clip. Glen was one of the pioneers of the expansion team Miami Heat as he started playing in their second year in the league. Being picked 4th overall in 1989, hopes were high for the former Michigan Wolverine in a team comprised mostly of castoffs from other teams. Standing at 6'8" at small forward, it was difficult to guard Glen as he could shoot from the outside as well as take it to the hole. He was not a limited offensive player who was a mere spot-up shooter like many three-point specialists; he had the necessary dribbling skills to score in the paint. When Glen would get hot, the announcers would often jest that "the Rice is cooking." When on fire, Glen can easily score 30 or 40 points. No lead was safe from this three-point marksman. Glen would also prove his worth against other three-point shooters when he won the Three-Point Shootout in 1995. He bested notable marksmen such as Reggie Miller, Steve Kerr and Chuck Person. After six years with the Heat, Rice was traded along with Matt Geiger in exchange for big man Alonzo Mourning of the Charlotte Hornets. Rice would team up with Larry Johnson and help Charlotte become perennial playoff contenders. When Larry Johnson was shipped to the New York Knicks, the spotlight was now solely on Glen Rice. With offensive threats Vlade Divac and Anthony Mason now patrolling the paint, Glen had two people he could rely on to pound the ball in the paint when needed, and when things get too crowded, they could simply kick it out to him for the trey. In Charlotte, Rice would develop into the elite player the Hornets envisioned when they traded for him. He would become one of the games elite scorers and would even capture the All-Star Game MVP in 1997. For the night, Glen was the star of stars. Glen's brilliance would not go unnoticed, and he became a coveted commodity. Shaquille O'Neil pushed for the Lakers to acquire Rice as he felt he was a key piece of their championship puzzle. The Lakers pulled the trigger and exchanged Eddie Jones and Elden Campbell for him. 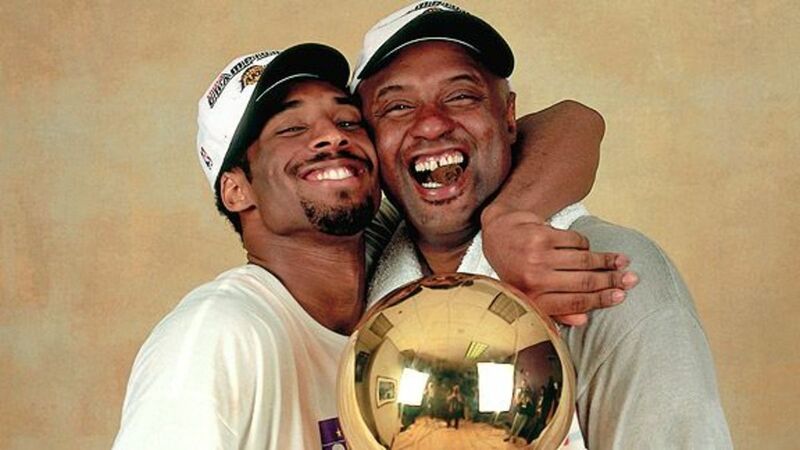 This was a bitter pill for the Lakers to swallow as Eddie Jones was one of the most exciting young players in the league and is a fan favorite in Los Angeles. Alas, sacrifices needed to be made. Glen Rice was becoming a malcontent, so he was shipped to the New York Knicks in 2000 in a four-team, 12-player blockbuster deal. With the Knicks, Glen received a diminished role. From being the third option in the Lakers, he became a sixth man on the Knicks. Glen spent a single season with the New York Knicks and was shipped again the following season. He was traded to the Rockets for Shandon Anderson. In Houston Rice would be a role player that helped space the floor for Steve Francis, Cuttino Mobley, and Yao Ming. After 2 years with the Rockets, Rice was traded to the Jazz for John Amaechi. The Jazz were trying to rebuild after Stockton and Malone, so they promptly waived Rice. Rice signed with the LA Clippers but only lasted 18 games. A knee injury ended Rice's stellar career. 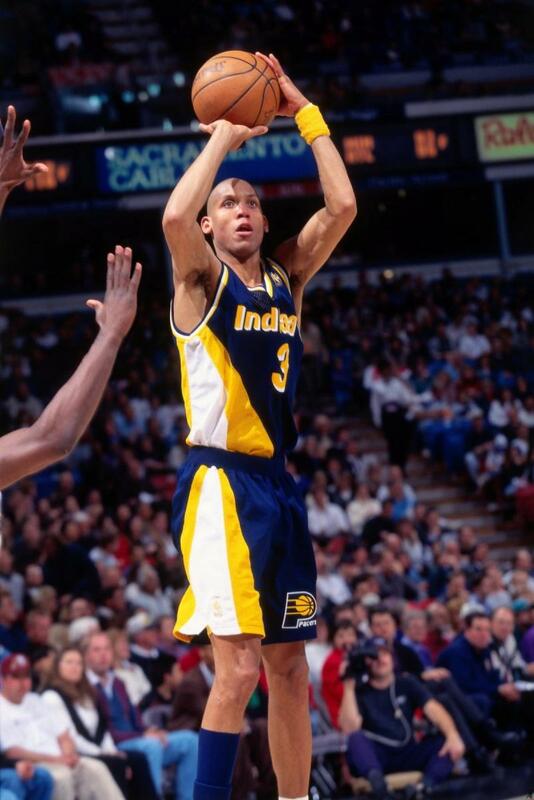 Reggie Miller was money in the 4th quarter. While Reggie was not an imposing figure like Shaquille O' Neil or Dikembe Mutombo, he was a scary player in the 4th quarter. The 4th quarter is "Millertime" for Reggie and is the time when he turns it on. No lead is safe when Reggie is around as he can easily erase deficits in the blink of an eye. Just ask the New York Knicks. The Knicks fans hate Reggie as he is a conference rival and because of the 8 points in 8.9 seconds, he scored on May 7, 1995, to trounce the Knicks in Game 1 of the Eastern Conference semifinals. The Knicks had a commanding 105-99 lead with 18.7 seconds remaining in the game. Miller was jaw-jacking with director Spike Lee and shot the ball in front of him. He steals the ball from Greg Anthony then hits another three-pointer in front of Spike Lee. Sam Mitchell fouls John Starks, and he clanks both free throws. Miller rebounds the second miss and gets fouled by Anthony Mason. He then seals the game with two free throws. Reggie learned how to shoot from long distance because of his hall-of-fame sister Cheryl. Cheryl was much taller than Reggie when they were growing up, and Reggie was tired of getting his shots blocked. He then learned how to shoot from long distance because of this. Reggie had a reputation of being a marksman and participated in the Three-Point Shootout five times. Though he never won the event, his shooting prowess was still widely respected throughout the league. Reggie has a long eighteen-year career with the Indiana Pacers where he had accumulated 2,560 three-pointers shooting at a 39.5% clip. 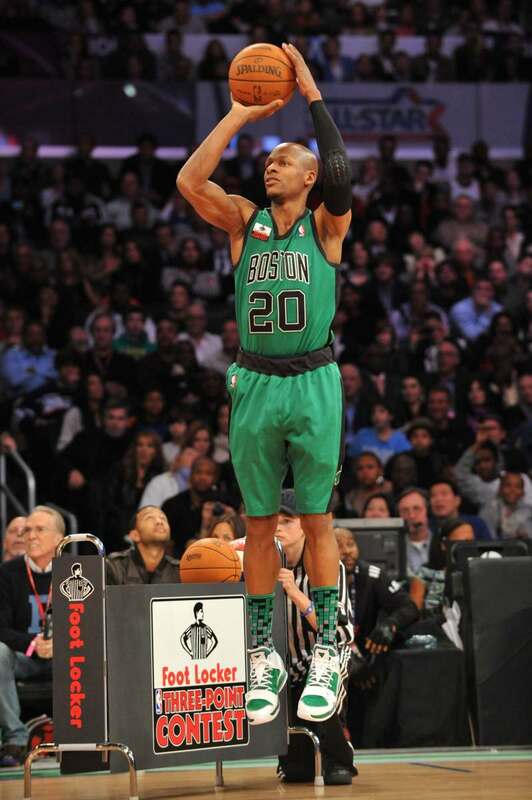 Ray Allen joined the Three Point Shootout during his time as a Celtic. Ray Allen was part of the legendary 1996 NBA Draft that included the likes of Allen Iverson, Kobe Bryant, and Steve Nash. He was originally picked 5th overall by the Minnesota Timberwolves but swapped on draft day for Milwaukee's 4th pick - Stephon Marbury. In Milwaukee, Ray joined Glenn Robinson and Sam Cassell to form a big three. The height of their success was the 2000-2001 season where they reached the Eastern Conference Finals. They were close to getting to the Finals but were vanquished in seven games by an Allen Iverson-led Sixers squad. Ray Allen, Ronald Murray, Kevin Ollie, and a conditional first round pick were eventually traded to the Sonics for Gary Payton and Desmond Mason. In Seattle, Allen would team-up with Rashard Lewis to form a formidable scoring duo. The two were both unstoppable three-point shooters who could also take it to the hole when needed. Danny Ainge became the Executive Director of Basketball Operations for the Celtics in 2003 and had felt the brunt of several losing seasons. "Trader Dan" did what he always does. He stockpiles assets such as draft picks, young players and expiring contracts in order to land much more desirable players. After the 2006–07 Celtics finished with a 24–58 record, Trader Dan decided to roll the dice. He acquired Kevin Garnett in a sweetheart deal through his buddy Kevin McHale. He also got Ray Allen and Glen Davis in exchange for Delonte West, Wally Szczerbiak, and Jeff Green. The Celtics were a miracle team as they went from the worst team to the best team in the span of one season. 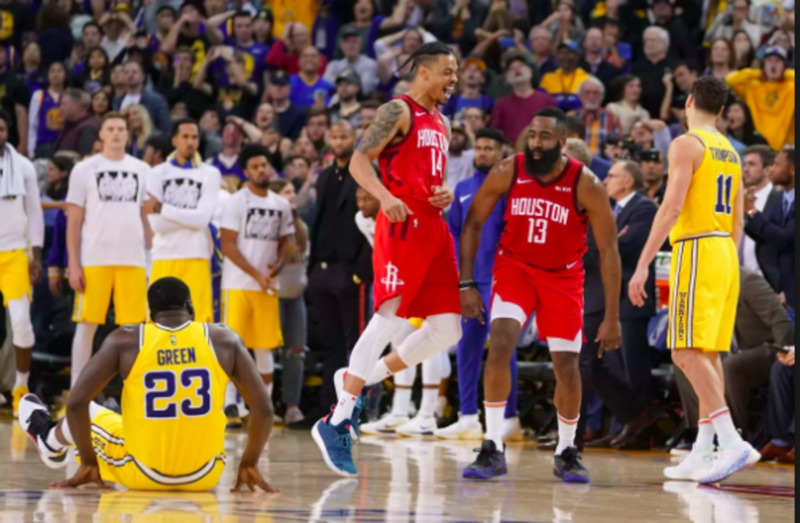 To make the victory even sweeter, this was at the expense of their long-time rival Los Angeles Lakers. Ray was a Celtic for five seasons but jumped ship to the rival Miami Heat in the 2012-2013 season. This left a sour taste in many Celtic fans' mouths including Celtic players such as Kevin Garnett and Rajon Rondo. Jesus Shuttlesworth had become Judas Shuttlesworth. Ray would help the Heat Capture the 2013 NBA Championship through some late game heroics. The Spurs were on the verge of their fifth title when Ray Allen virtually stole it from their grasp. After two seasons with the Heat, Ray retired on November 1, 2016. He has the record for the most three-pointers made with 2,973 and has the sixth most in a season with 269. He also won the Three-Point Shootout in 2001. 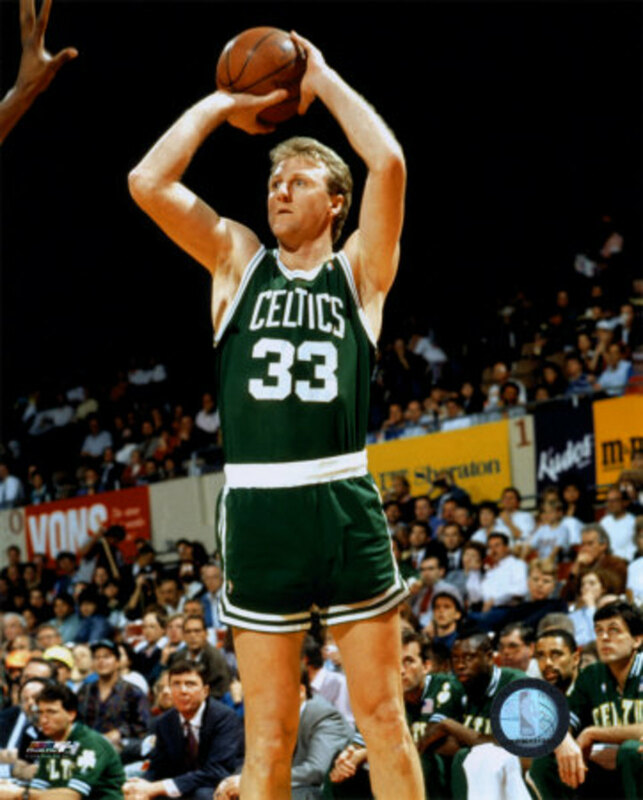 Larry Bird was one of the deadliest shooters in his heyday. Larry was doing the three ball during the time teams wanted to pound the ball inside. Larry was a big man whose shooting stroke rivaled that of most guards in the league. He helped pave the way for future shooting big men such as Keith Van Horn and Dirk Nowitzki. Larry learned to shoot in the cornfields of Indiana. There, thousands of farm boys used to play a lot of basketball and hoped to get to the professional leagues one day. A lot of these people were not well off so basketball was a good cheap way to stay fit and have fun. When Larry went to college, he led the Indiana State Sycamores to the NCAA championship game. This was a Cinderella story that ended with the much more talented Magic Johnson-led Michigan State Spartans halting the Sycamores' undefeated streak at 33 games. This game was just a taste of what would be one of the game's greatest rivalries. Larry Bird and Magic Johnson practically monopolized the championships in the 80's with Larry winning 3 and Magic winning 5. This rivalry would revive interest in a faltering NBA product. Larry was a good three point shooter - shooting at a respectable 37.6% career clip. He also shot over 40% from deep five times. Larry made 649 three-pointers in his stellar career. While this may not seem much in today's game, back then the three-point shot was seen more as a gimmick that the NBA stole from the ABA than something to revolve the offense around. Good shooting bigs were few and far between. There were hardly any stretch 4's or 5's in the league. Larry was a rarity back then. When the Three-point Shootout became a thing during All-Star weekend, Larry won the inaugural event as well as the next two contests. It was no question for Larry who would come first. It was a matter of who would be the runner-up. 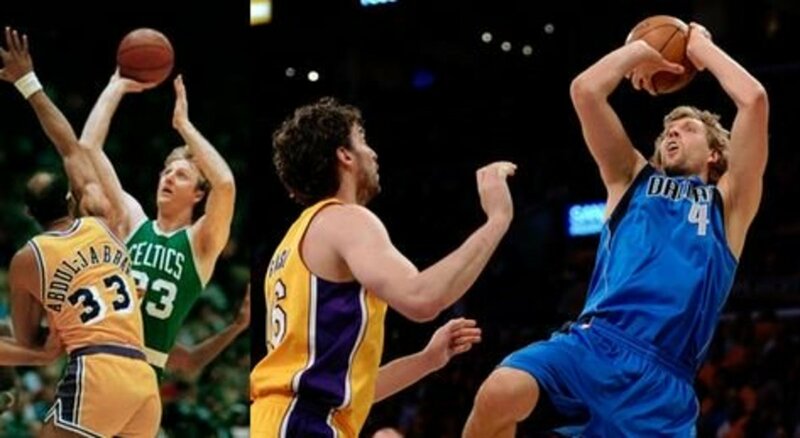 Who is the greatest three-point shooter? Where does Jason Kid fall in the list of greatest three-point shooters of all time? For me he is in my top ten list for point guards. For overall it is hard to say. There is already a top 50 players from league history and that does not even include LeBron or Kobe. Who was the best point guard and facilitator of the basketball? In my opinion best point guard of all time is Magic Johnson hands down! I would maybe include Korver in another article.